Chic Alert: Stella McCartney Designer Discount Clothes on Target! 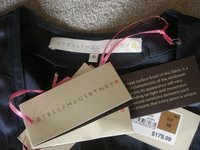 Stella McCartney Designer Discount Clothes on Target! All the reports are now in and it was definitely nothing short of a buying frenzy at Target department stores today. The budget Stella McCartney, sassy and chic, winter collection of new women and teen designer clothing as first paraded on the fashion runway during the 2007 L'Oreal Melbourne Fashion Festival, was finally released for sale. 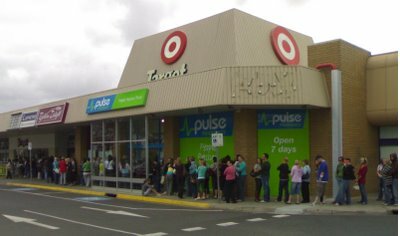 Reports are that within half an hour of opening it was a designer fashion sale sell-out at Target stores around the country, including Melbourne, Sydney and Perth. Believe me it was no different at the Melbourne store that I went to and with the eager women and teen lovers of designer fashion stretched out in a line as far as I could see and around the block (see image below), when the doors finally opened at 10:00am these fashionistas simply paid no heed to the clearly visible "no running" signs. Possessed with an insatiable shopping appetite they just raced to the Stella McCartney fashion stacked racks and once there, just grabbed anything that they could get their hot little hands on. Within 20 minutes it was virtually all over; racks emptied, shelves bare and even the mannequins stripped naked of their Stella designer fashion clothes :). It's not hard to imagine what any department store with three or four hundred frenzied women and teen shoppers all after the same limited designer fashion clothing would be like. To give you some idea of the frenzy, some of the racks were emptied within 30 seconds and, for example, when the second batch of trench coats were brought out to re-stock the empty shelves, they suffered the same fate but without even having made it to the shelves. These hot Stella McCartney coats were snatched straight out of the shop assistant's hands. I've been to many designer fashion sales but have never ever been to or seen a fashion sale anything like this! There were even women and teens climbing over each other and blindly grabbing anything that they could reach. As well as being stripped naked of its chic designer clothes, one of the mannequins even lost both its arms and I reckon with some of the war-like face-to-face stares, some of the girls could have easily ended up in the very same state if it were not for the security staff present!! Of course this behaviour is all explainable! It is rare after all to have designer fashion clothing available at an affordable price and this Stella McCartney, Target promotion certainly gave trendy women and teens a fantastic opportunity to get designer clothes at bargain prices. The bargain prices and limited stocks together made the Stella McCartney range highly sought after but the real surprise to me when I first heard about this designer fashion sale was that instead of it being run by the higher-end designer fashion retailers like Myer and David Jones, it was happening at Target, a normally fashion on a budget shop. What a coupe! Before I got to the sale my plan was to buy the Stella McCartney dove-grey, taffeta trench coat, the olive green silk dress with beading around the neckline and the sassy and chic, long V-necked wool-cashmere jumper similar to that worn by celebrity Jennifer Aniston. I thought, that the much-hyped Stella McCartney trench coat in grey and navy at $200 and the long, V-necked cardi at $150 were must-have fashion bargains. When compared to the $400 price tag for a similar coat at Country Road, the Stella coat was a definite designer fashion bargain at $200, and after all, it was a Stella McCartney designer coat. However, despite my best plans, in the frenzy all I managed to grab in my size was the Stella McCartney midnight colored Silk/Cotton Empire Dress shown above ($180) and the Silk/Cotton, dusk, pleated blouse shown below ($100). My girlfriend was a little luckier and despite the chaos and fast emptying racks, she managed to grab the Stella McCartney suit jacket and the billowing top in blush pink. The jacket in particular, is a really sassy and chic fashion garment with beautiful stitch detailing. In the mayhem there was absolutely no chance to visit the change rooms and try the fit before you buy :( It was simply a matter of grab what designer fashions you could, join and get through the long cash register queue, and then get the hell out of there in one piece and with your bag of designer fashions sill in your possession!! This Stella McCartney and Target promotion was certainly a win-win-win. Target had a massive win over its designer fashion big sisters Myer and David Jones; it was a great way for Stella McCartney to reach a wider women and teen, designer fashion audience and to get them to know her line, and of course fashionistas got the benefit of buying high-end fashion from an international Fashion Designer like Stella McCartney at bargain prices. Although a limited collection, what I also like about this Stella McCartney line is that even with a few garments, say a couple of jackets and tops, a pair of designer jeans, and a skirt or two, you can easily mix and match to create a number of very different, sassy and chic, designer fashion outfits. I was at the sale in Bris-Vegas and staked out what I thought was the best store to go to. I went 1 1/2 hours early but it turned out they opened an hour early !!! Fortunately I only had 13 people in front of me and I made it through to the racks okay. I managed to get 15 items - 10 of which I put back on the shelves as they didn't fit, or just didn't work on me. I foolishly returned the beautiful blue dress to the racks only to discover that it's almost IDENTICAL to a dress Stella designed about a year ago and was selling on eBay for $2,000 US. I bought a pair of jeans, the sage green silk top, the camel wool suit and the black jersey tie up top. Wow you did extremely well, I mean 15 items to start with and choose from....if you started with 5 and ended with say 2 you would have been worse off I guess. Just wondering if the blue dress you mention is the Empire Dress I mention in the post. Hey chic-e-style thanks for commenting about the Stella McCartney goldish silk scoop neck dress. Can you send me an email about this. You'll find my contact details in the sidenar.